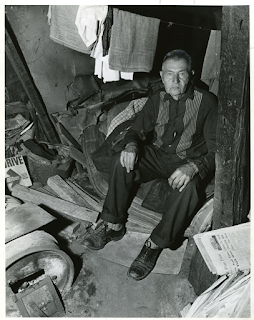 This is the story of Ivan "John" Rudy, a man who lived on the periphery of Winnipeg society. If not for being the last resident of Elmwood's "Tin Town" by some thirty years his life would have passed without notice. There were a number of shanty communities around Winnipeg throughout its history. Rooster Town is likely the best known thanks to a recent book published on the subject. "Tin Town" was located at what was Elmwood's "nuisance grounds", or dump, located at the present day south-east foot of the Nairn overpass at Grey Street. 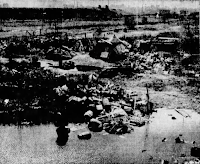 Dumps were common places for such communities. There was a "Tin Town" near Transcona's dump and St. Boniface at one point had ten families living at theirs. It was certainly poverty that drove people to such places, though for some it was also a case that they shunned city life, or city life had shunned them. 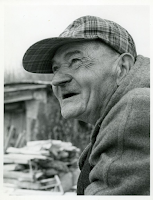 John Rudy was born December 27, 1895 in present-day Poland and came to Canada in 1914 to begin a life of a labourer working in hundreds of logging camps, railway gangs and farms. 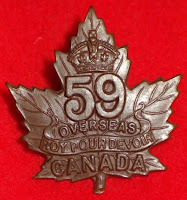 Not long after arriving, he decided to enlist with the 59th Battalion at Kingston, Ontario in 1915. According to his military file Rudy was not an exemplary soldier to start. Between February and June 1916, he was disciplined on a number of occasions for insubordination, disobeying and officer and improper conduct while on parade. By August he was transferred to another battalion and the disciplinary issues ended. In 1917, Rudy, who was a Sapper, was wounded on number of occasions. In August, it was a gunshot wound to the right ear. In October, it was a gunshot wound to the right shoulder which included shrapnel wounds to his head. He was still recovering in hospital in January 1918. Rudy was discharged soon after and in 1924 came to Winnipeg via White River, Ontario. Not wanting to live in the city, he chose "Tin Town" and salvaging supplemented his small military pension. Though today it is part of the city's core, at the time there was no Nairn Overpass so it would have been an isolated "no mans land" cut off from the west by railway tracks. Nothing was written about Tin Town during its existence. The only recollections about it come from a handful of newspaper interviews done with Rudy in the 1960s and 1970s, the first being by Val Werier in the Winnipeg Tribune in 1962. Rudy said that when he arrived in Tin Town it was already an established community of people, mostly older men, living in dwellings made out of salvaged wood or tin, thus its nickname. Its population peaked during the Depression with 40 or 50 residents. Rudy's home was a three metre by three metre hut that stood 1.5 metres tall - not enough room to stand upright. It was covered in clay and sod on three sides and the front door had a small window with a grate across it. Inside, there was a pot-bellied stove, a bed with a mattress, and an oil lamp. The end came for Tin Town in 1947. 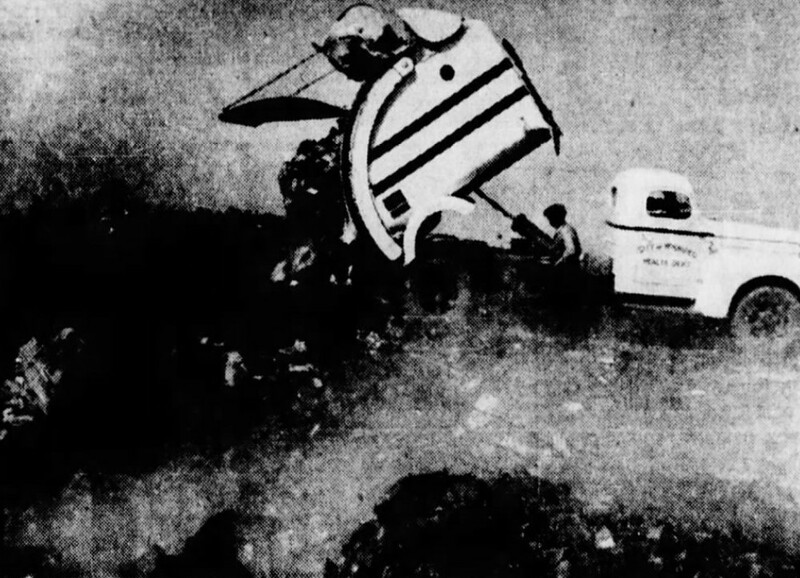 The Elmwood dump was nearing capacity in the early 1940s and issues such as dust storms, smoke from fires that smouldered for weeks or months deep beneath the fill, and the fact that some of its tens of thousands of rats were wandering into residential areas in search of food, were impacting nearby homes. 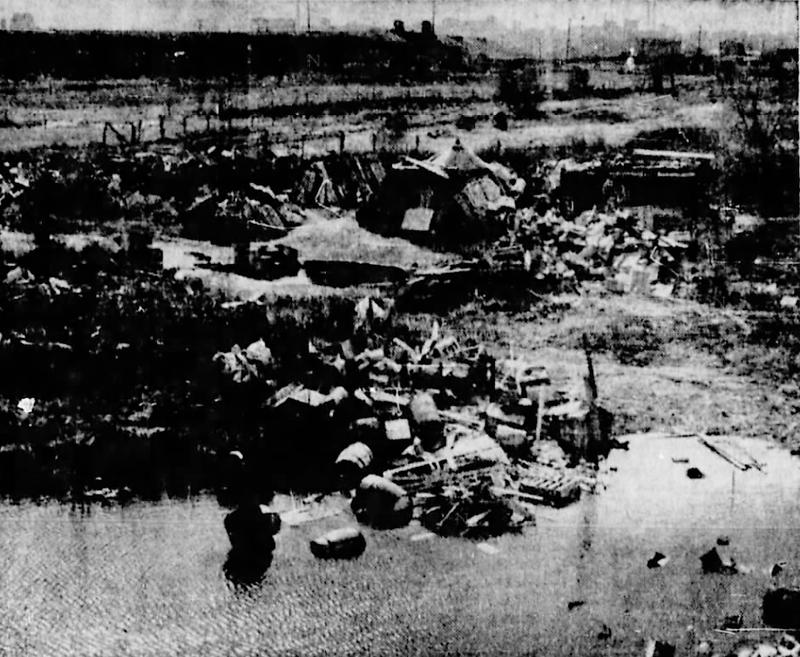 When the war ended, a group of residents threatened legal action against the city if they didn't close the dump for good. The city's first step to appease them was to try to clean it up and Tin Town was a casualty. City officials expressed surprise at the settlement, though unofficially they must have known about it as city dumps were staffed and had a full-time supervisor. There were just a couple of news items in the Tribune by Werier about the clearance featuring a couple of the men who had been sent packing. One was Fred Kowal who would only say he was "over 60" and originally an immigrant from Europe. He had spent his life working odd jobs in rural Manitoba before coming to the city. As he received no pension, he could not afford the 25 cents a night to stay at a "flop house". Instead, he bought a shack at Tin Town for $3 from the previous owner. City officials found him so weak and malnourished in his shack that he had to be carried out by ambulance attendants. He was brought to St. Boniface hospital to recover. Another resident, Louis Dirda, was 77 and received a pension of $25 per month. He, too, was a European immigrant who had worked construction and as a labourer most of his life. Prior to coming to Tin Town he lived in a rooming house on Lily Street that cost $12 per month leaving him with only enough money to eat every second day. In late 1945, Dirda bought a shack at Tin Town for $10 and was able to eat well daily. 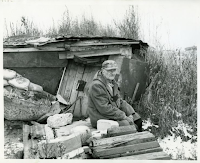 In February 1947, fire destroyed that original shack and his new dwelling, made from what could be salvaged in the middle of winter, was just four 1.2 metres by 2.1 metres and stood just over a metre tall. A pile of rags on a bench was his bed. A couple of days later, a story appeared that W. Cook of Copon Chemical and Plastics on Winnipeg Avenue wanted to offer a job to Kowal and others contacted the paper wanting give donations to Dirda. There was no other follow up about the men or their situations after they left Tin Town. The cleanup of the dump continued. It included laying out around 600 kilos of rat poison and putting up fencing in places to keep illegal dumpers out and kids from getting in. The fire department spent days dumping water on smouldering spots and extra bulldozers were dispatched to compress the piles of ash and waste that had build up. In July, city officials showed off the new, improved dump. E A Wood of the city health department told reporters, "its a treat to behold". This was just a short-term solution to keep the legal action at bay. The use of the dump by the city was reduced dramatically later that year and they employed extra shift at the nearby incinerator to burn more garbage. In 1948, the city's new Henry Avenue incinerator opened and the Elmwood and Saskatchewan Avenue dumps were phased out of use. John Rudy, who at the time of the clearance was aged 52, said he returned to old settlement later in the year. With his war pension of $77 per month, he could afford a room and knew others from the settlement that ended up renting apartments or rooms. He told a Free Press reporter: "I could stay in a rooming house but I never liked them. I got all I want here. I buy the newspaper and they're always talking about trouble somewhere. I don't like trouble." The Tribune's Val Werier, who had covered the clearance of Tin Town in 1947, caught up with Rudy in 1960 and wrote stories in July and December giving a sense of Rudy's daily life. At least twice a week, Rudy walked down to the Talbot Avenue corner store of Steve and Mrs. Hyndiuk on Talbot Avenue to check his mail, buy the newspaper and food for himself and his cats. Mrs. Hyndiuk said of him: "He never says much. But he's always happy". Rudy got his water filled at nearby industrial buildings or the city's mosquito abatement office. When he needed a shower, he visited a friend or went to the YMCA. Daily life was mostly labouring in the small vegetable garden behind his shack and collecting and cutting wood for the two cords he would need to heat his stove through the winter. Rudy wasn't a complete hermit. On occasion he would visit former Tin Town residents or walk down to Main Street or the LaSalle Hotel for a couple of glasses of beer with other old-timers. He summarized his life to Werier by saying: "I'm okay. I have no pains. I eat lots. I sleep well." Another Tribune reporter caught up with Rudy in 1968. By this time, he was 72 and collecting an old age pension as well as his war pension, for a total of $147 per month. He said that he lived well but after 44 winters in his shack he knew that his time there was coming to an end. He resisted the invitation to give up his lifestyle and move into the Royal Canadian Legion veterans housing at 675 Talbot Avenue, telling the reporter: "People don't realize no more how nice it is to be free and completely independent". After the dump was closed the city parceled off the old nuisance grounds site. Some was sold to Alsip's Brick Works and the portion that Rudy lived on was sold to Chuck Abramson, owner of Red Patch Taxi, where Rudy would sometimes go to clean up or fill his water container. When asked by a Free Press reporter in 1969 what he thought of Rudy living on his land, Abramson replied: "He doesn't bother me. I don't bother him. He can live there 120 years for all I care. It's none of my business if he wants to live that way." In October 1970, the last newspaper article appears about John Rudy, aged 76 and stubbornly refusing to move to the Legion housing. At some point, Rudy must have moved to the Legion housing as the notice of death form in his military file shows that address. John Rudy died on May 28, 1983 at the age of 88. A three-sentence obituary appeared in the Free Press stating that he had died at Deer Lodge Centre at age 88, that "Mr. Rudy had served in the First World War". Rudy, who never married and had no children or any other relatives in Canada, is buried in the military section of Brookside Cemetery. Quite the story about how determined a person can be. Very resourceful person. One wonders if having survived the horrors of World War I, Mr. John Rudy had , a disorder related to it? Unfortunately, veterans falling through the cracks still happens.